A photo of Stephen Lee from Derrymoyle with John Fahy (on far side of picture) & his sisters Julia Molloy & Bridget Fahy. John & his sister Bridget lived in Gortachalla. Julia lived in Baurisheen. Hi.I’m trying to trace an old friend of my mams…she would love to try reconnect with her.. The lady is called Cecile Fahy daughter of Michael and Bridget.Mam thinks she was possibly born 1952..we believe she is from oughterard area but lived on salthill when mam knew her..
Hope someone can help us out .. The photo above was taken in 1962 at the home of John Fahy and his sister Bridget in Gortachalla. Mary Connell’s parents were John Connell and Honor Hart. Honor Hart is reputed to have come from the island of Innismicatreer in Lough Corrib. Can anyone give an approximate date for the photo? My Connells were from Gortachalla. Do you know who Mary Connell’s parents were? Also, Sarah Connell, from Gortachalla and daughter of Patrick Connell and Sarah Tierney, was married to a Mr. Lee. Possibly related to Stephen Lee in photo? 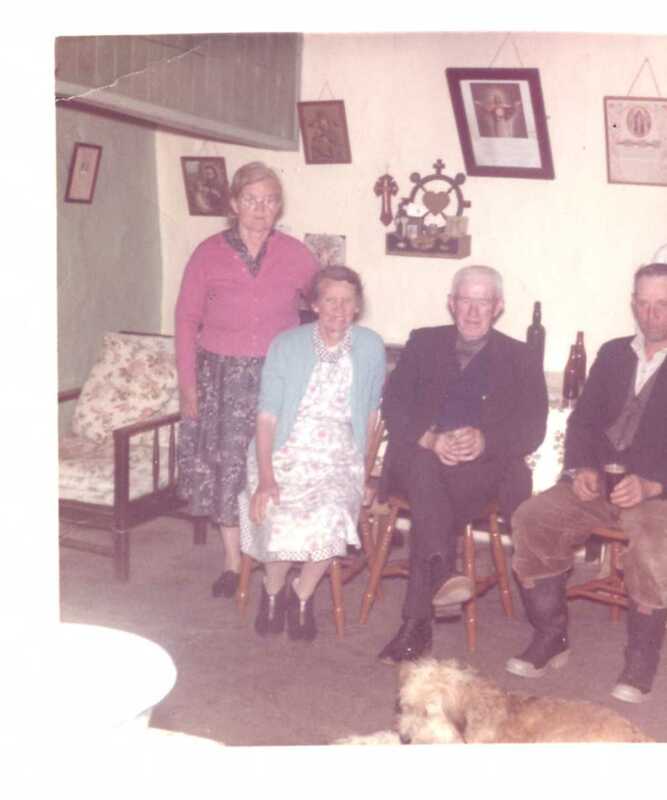 The “Fahy’ s in this picture are children of Peter Fahy, who married Mary Connell of Gortachalla, Moycullen and son of John (Sean Ruadh) Fahy and Mary Carter of Gortacarnaun. Peter was half-brother to Honor Fahy Moloney, (Patrick) Shrue and Bridget Fahy O’Connor, Camp Street, Oughterard. How wonderful. I want more. The picture of the Sacred Heart on the wall is in my home now. I got it during a trip to Ireland in 1988.